All my Mamaw has to do to get the family together, is tell us she’s making fried chicken. I love her chicken so much, I incorporated it into Christmas! I’ll be sure to share those traditions in a future post. My Mamaw does not make her chicken very often because it’s not exactly the most healthy food. When you want to indulge, my Mamaw’s fried chicken is an absolute guilty pleasure. Now I probably shouldn’t be messing with perfection, but as I was researching different fried chicken ingredients I noticed one common denominator. Buttermilk. You see marinating the chicken in buttermilk, is supposed to make the skin crispier, think KFC. So I decided to test this theory against my Mamaw’s Family Favorite Fried Chicken. Here we go. You can do an assortment of chicken: 2 Breasts, 2 Thighs, 4 Wings, 4 Drumsticks. You get the point, if they have a family pack at the grocery store, just make sure you get chicken with the bone-in. Cheaper, and it holds flavor really well. You can find this in the baking aisle of most grocery stores near the regular flour or spices. The measurements don’t have to be exact, but in this case, I’d rather you have more than less. I really don’t like giving exact measurements because everyone’s tastes are different. 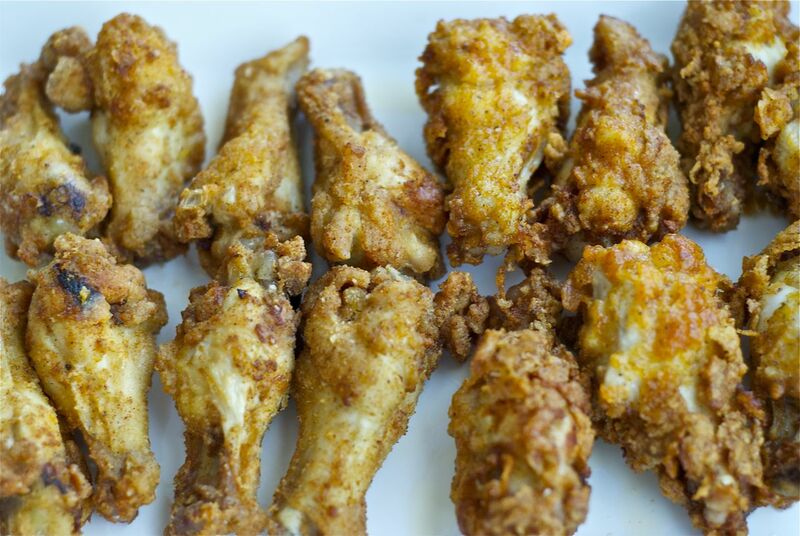 Only if you’d like a more flaky crispy wing, but if you don’t have it, don’t worry about it! Mamaw will be happy, she’d probably say you shouldn’t mess with the best! Ha! I love her! I’m only adding it for my own curiosity. First make sure you clean your chicken, and pull off any feathers that may have been left. Chicken with Buttermilk: Place all chicken into a baking dish (I use my glass brownie dish). That way the chicken can be fully covered by the buttermilk. Add the buttermilk, cover with plastic wrap, refridgerate and marinade for 30 minutes. You can also let it sit overnight, but you must use it within one day. Chicken without Buttermilk: All you have to do is clean the chicken and then follow the directions below. I have an electric skillet, which is perfect for frying, if you have one too, set that baby to 350˚F. You can also use a heavy frying pan, or a large saute pan about 3-4 inches deep on medium heat. Use anything where the chicken will fit, and be covered by the frying oil. The oil should take about 10 minutes to properly heat, but you can always check by sprinkling a little of the flour in the oil. If it sizzles immediately then it is ready to work. While you wait for the oil to heat you can flour the chicken. Is that a plastic bag you put the flour on? Why yes it is. Flouring (putting the batter) on the chicken can be such a mess to clean up. My Mamaw taught me this little trick, mostly for quick clean up. Just make sure you rinse and dry the plastic bag before you use it. 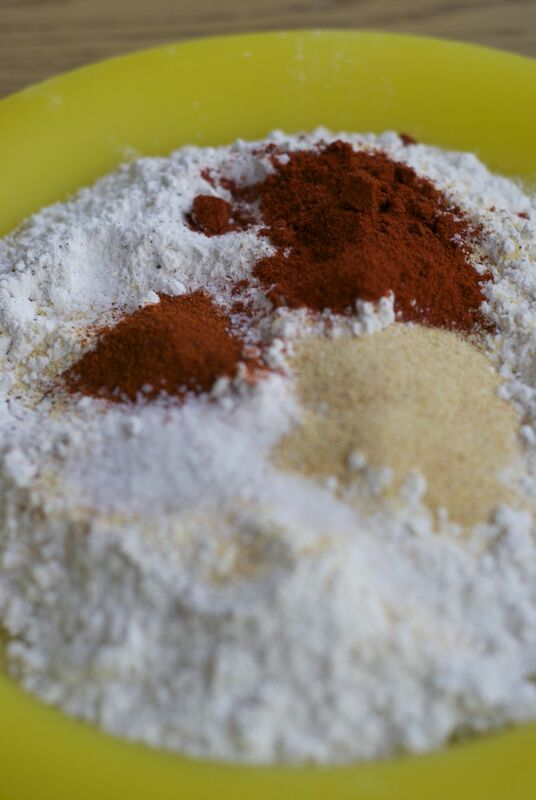 Place the flour on the inside of a pre washed plastic bag, and add salt, garlic powder, paprika, and pepper. Mix. 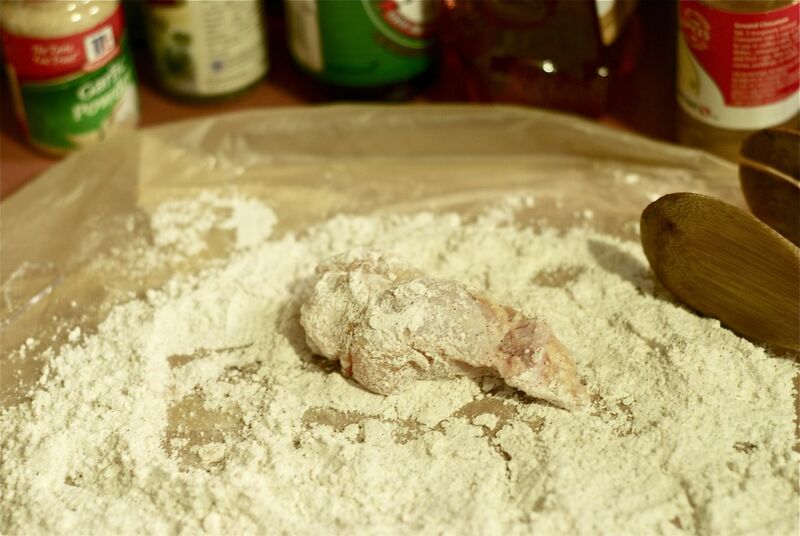 Dredge the chicken, coating it in flour mixture, and set aside in a bowl or large plate. Once finished you should be able to lift the handles of the plastic bag leaving the left over flour on the inside of the bag, and throw it away. Quick and easy clean up. When the oil is hot enough (around 350˚F), use tongs to place the chicken in the oil. BE CAREFUL! The oil WILL pop. You will probably have to place the chicken in batches, but make sure you give each piece room to fry. Cover to avoid splatter. Let cook untouched for about 5-10 minutes, depending on the size, then turn. The bigger the piece the more time it will need to cook. Repeat. You will know when the chicken is ready because it will brown, and will float on the top of the oil. Place finished chicken on a serving tray lined with paper towels. This will help absorb excess oil. You can either remove the paper towels or serve as is. On the left is my Mamaw’s Recipe with no added buttermilk, and on the right is fried chicken with buttermilk. I will add more pictures soon, but used this recipe to make Honey BBQ Wings. This is before I coated the chicken with sauce. I can see a difference as the wings with buttermilk are flakier. However, when it comes to taste, well, I’ll let you be the judge. Can you tell the difference?